I’m posting this because one of the founding members of The Kingston Trio, Nick Reynolds, has just died. 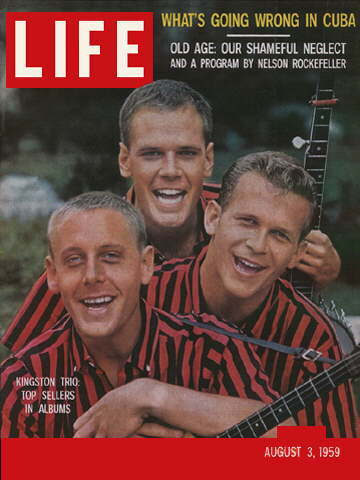 The Kingston Trio was at the forefront of the 1960’s folk music revival. Their popularity in the late 1950’s and early 60’s (They had four top 10 albums in 1959 alone. The Beatles are only other group to have four top ten albums in a single year) paved the way for the likes of Peter, Paul and Mary, The Byrds, and the Beach Boys, not to mention Bob Dylan and his contemporaries. A live recording of the Kingston Trio captures the between-song jokes and banter that their studio recordings lack. This particular recording was made in 1992 and lacks the contributions of Dave Guard, another founding member of the Trio, who died in 1991. But 2/3 of the original Trio, Nick Reynolds and Bob Shane, are present, along with George Grove, who performed with various incarnations of the Trio for over 20 years. Cool post. you may also be interested in this. My dad used to sing this song a lot, brings me right back to being a young boy. What a great idea for a site, nicely presented as well. I thought that magazine cover was great as well. Castro had been in power in Cuba for about 6 months in August 1959. “Life” was terribly sensationalist. Very much “yellow journalism.” Great photography, though. Yesterday I filed the newspaper clipping of Reynolds’ obituary from the Philly Inquirer in the vertical file at the library. Along with junk about the orchestra, the opera company, and how the singer from Ween likes to go fishing.